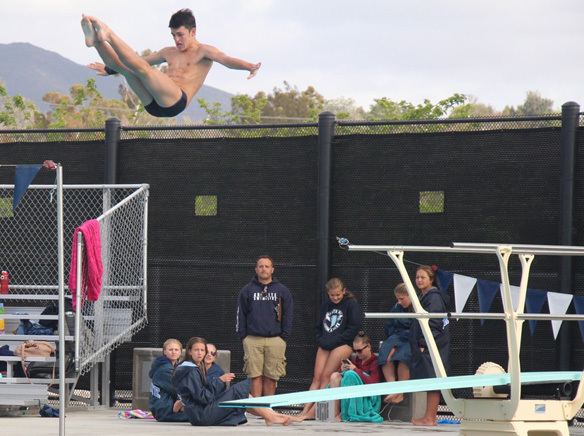 Talented divers from San Diego area high schools took flight this past Saturday at the Granite Hills Ben Hedburg Invitational. 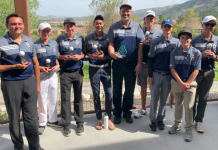 Held at the impressive aquatic center at Granite Hills High School, the event showcased an impressive array of local talent. The day’s winners included Kara Justerson from Helix High School for the women’s, and Chris Walter for Santana High School for men’s’. Walter’s ambitious dives and nearly flawless entries had the crowd mystified that would have had local diving legend Greg Louganis on his feet. The meet was held primarily as a “prep meet for CIF,” said Granite Hills coach Chris Dalman. Most of the competitors represented local Grossmont District schools, but a few non-conference divers from as far north as Mount Carmel High School participated in the event. Each diver had six or eleven attempts to show their skills. This was out of the norm for a traditional meet, Dalman said. Dalman offered nothing but praise for the performance of all the divers competing. A lot were attempting a higher degree of difficult dives largely untested in actual competition. 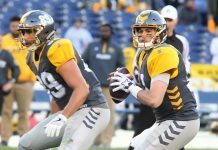 This was combined with less than favorable weather conditions, which included high winds and increasingly cold temperatures. As many parents and spectators sat bundled up in coats and blankets, the divers battled the elements in nothing more than bathing suits and waited drawn-out amounts of time between their individual dives. Despite the climate adversity and treatment as a practice run for more meaningful competitions later in the season, the divers aimed to impress. Many utilized the invitational as a bridge out of their comfort zone. This meant slightly less pristine dives and perfect scores, but the divers gained invaluable experience. As for the rest of the season, the divers are entering the home stretch of their season as they prepare for CIF championships next month. There are several intraconference dual meets scheduled between then and now, with conference championships in mid-May. Many of the divers on Saturday will most likely qualify for these meets and compete against the county’s finest high school diving talent.